Feldmannia irregularis (Kützing) Hamel recolectada en la zona Sur del Macizo Guamuhaya. Foto: Ángel Moreira. Published in: Hamel, G. (1939). Phéophycées de France. Fasc. V. pp. i-xlvii + 337-431, [432, expl. pl. ], [i]-xliv, xlvii], figs 56-60, 10 pls. Paris: [Publié par l'auteur]. The type species (holotype) of the genus Feldmannia is Feldmannia lebelii (Areschoug ex P.Crouan & H.Crouan) Hamel. 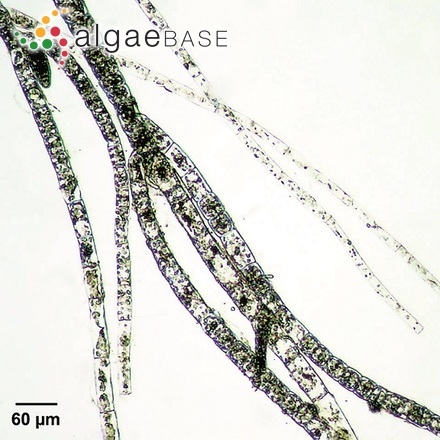 Type locality: Adriatic Sea (Silva, Basson & Moe 1996: 564). Type: On Laurencia obtusa. Notes: According to Womersley (1987), the type specimen may be in L but apparently not located (Clayton 1974: 779). John et al. (2004) cite Ectocarpus simpliciusculus J. Agardh as a synonym of this species. Included in floras of Britain and Ireland from Atlas of Seaweeds of Britain and Ireland records. Aisha, K. & Shameel, M. (2011). Taxonomic study of the order Ectocarpales (Phaeophycota) from the coastal waters of Pakistan. 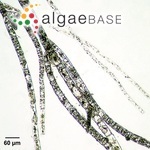 International Journal on Algae 13: 128-148. Hamel, G. (1939). Phéophycées de France. Fasc. V. pp. i-xlvii + 337-431, [432, expl. pl. ], [i]-xliv, xlvii], figs 56-60, 10 pls. Paris: [Publié par l'auteur]. Accesses: This record has been accessed by users 3468 times since it was created. Müller, D. G. & Frenzer, K. (1993). Virus infections in three marine brown algae: Feldmannia irregularis, F. simplex, and Ectocarpus siliculosus. Proceedings of the International Seaweed Symposium 14: 37-44. Robledo, D.R., Sosa, P.A., Garcia-Reina, G. & Müller, D.G. (1994). Photosynthetic performance of healthy and virus-infected Feldmannia irregularis and F. simplex (Phaeophyceae). European Journal of Phycology 29: 247-251, 3 figs, 3 tables.